SIM Reactivation Fee allows to re-activate your Iridium prepaid SIM-card. 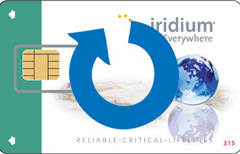 If your Iridium prepaid account expired more than 270 days ago, a SIM Reactivation Fee must be paid in order to load a new voucher on your account (on the same SIM-card). Your existing Iridium phone number is not guaranteed to be preserved. If your old phone number is not available, we will assign a new phone number to your Iridium SIM. If you prefer not to pay the reactivation fee, you can always purchase a new Iridium prepaid plan. We will mail you a new SIM-card and a new phone number will be assigned to it upon activation. Note: Include the full number of your SIM-card and the old phone number (MSISDN) in the notes to the order or email them to us at support@sattransusa.com after placing the order.